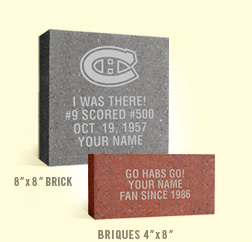 The foundation of Centennial Plaza is personalized bricks honoring the fans who have made Canadiens hockey synonymous with Montreal for 100 years. Quantities were limited and this was truly a once-in-a-lifetime opportunity to secure your place in Canadiens history. With each brick that you purchased, you received a complimentary replica brick with your personalized message to proudly display in your home or office. You also received an official Certificate of Recognition bearing your brick’s inscription. A portion of the proceeds from brick sales benefitted the Montreal Canadiens Alumni Association.